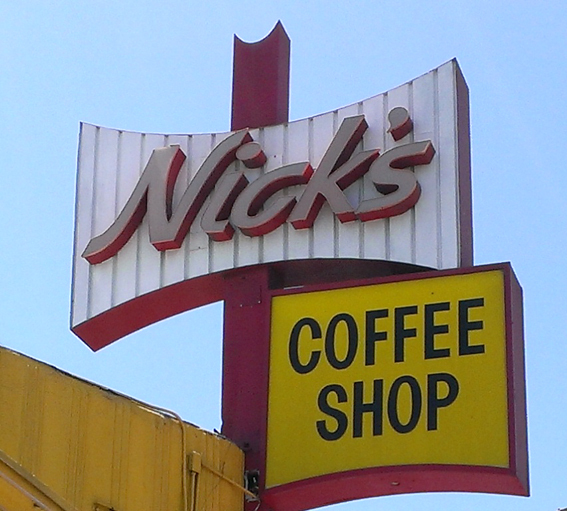 (1946) Nick’s Coffee Shop, Los Angeles | Remains of L.A.
-Colorful umbrellas over tables outside; inside are brown counter and chairs, brown booths and tables, but the dozens of celebrity photos covering the walls and the sharply slanted ceiling make it feel fun and busy rather than drab. Ceiling fans with bell-shaped stain glass lamps hang from the ceiling, and there are a surprising number of American flags hanging around. Over the door is a stained glass window that says “Kathy’s,” and there’s a clock that says both “Kathy’s” and “Nick’s.” There is also a large drawing of Kathy, who has passed away and was clearly much beloved. -I got the 6 oz NY steak lunch, which came with mashed potatoes and a biscuit. It could have come with veggies but I got fruit instead. Every single thing was great, the steak in particular was fantastic, and crazy cheap. -I sat at the counter, as the booths were all full. The counter was full too, enough that I had to sit next to people, but the chairs were spaced far enough apart that it was fine. -There was a tv up in a corner of the grill, a small square boxy tv with the sound off. It was almost invisible. I realized towards the end of my meal that it was showing The Dark Knight, but it was really so unobtrusive it was hardly there. -While I was eating, the AC vents directly over the counter dripped some water down. It didn’t hit my plate or anything, just the counter. Everyone was very cheerful about it, moving their glasses and calling to the counter guy. He came with an old-fashioned cane with a rag tied to it, and wiped the vents while holding a menu to catch any water. It was all shockingly charming. -The room you walk through to get to the bathroom seems like an odd combination of eating area and serving area. On one side is a large booth and a large mirror in an incredibly ornate gold frame, and on the other side is a coffee machine and a silverware tray and shelves holding miniature tubes of cereal. -The radio was playing ’80s music and every song was a song I liked, except for “Girls Just Want to Have Fun,” and it’s really no one’s fault that when I was twelve my stepmom named her convertible “The Girls Just Want to Have Fun Car” and TOLD MY FRIENDS that that was what it was named. I’d probably really like the song if not for that. 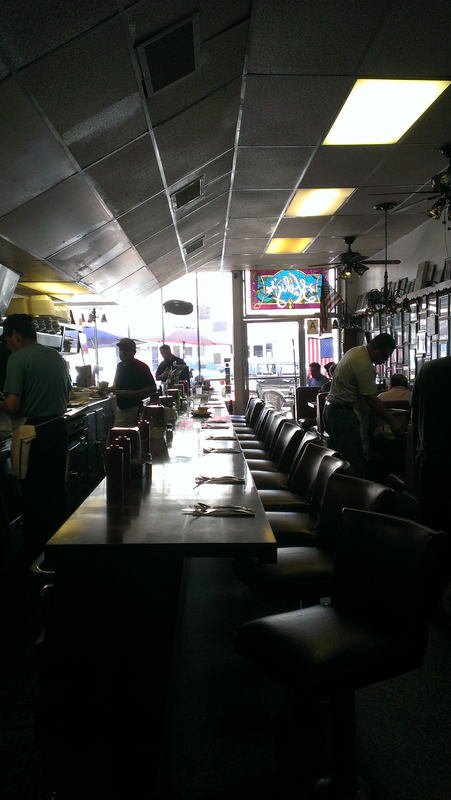 -When the waitress, who most customers seem to know by name, walked by, she congratulated the guy sitting on my left. He thanked her warmly, and I tried for several minutes to figure out a good way to ask what he was being congratulated for, and then realized if I’d been going to charm it out, the moment had passed twenty seconds after she’d congratulated him. I hate it when my nosiness is thwarted. -In another booth near me there were kids in their mid-teens, as ordinary-looking as imaginable. They were talking fairly loudly, and seemed to be (genuinely) more knowledgeable about music, musical instruments, concert sound systems, and the music industry than I am knowledgeable about anything. It was a delight to eavesdrop on, even though I understood one word in seven, because they were just so darned confident and competent-sounding. What I Read While I Ate: “We Followed Our Hearts to Hollwood” by Emily Kimbrough, the most utterly marvelous memoir about two women who came to Paramount Studios in 1942 to write a movie based on their book, “Our Hearts Were Young and Gay,” which is maybe my favorite book in the world. The memoir was written just a year or two after they left Hollywood, and is both hilarious and full of all sorts of delightful, delicious details of Hollywood at the time. I mean it, if you like old Hollywood at all, do everything you can to get your hands on this book. What Sort of Ghost I’d Expect to Find if I Believed in Ghosts Which I do Not: A movie producer having a clandestine meeting with a director about whether or not they should fire the movie’s male lead, who has been taking so many pulls on a flask between takes he’s falling over the sets. The actress starring opposite him is sitting in the next booth, eavesdropping, wearing a large hat that conceals her face.